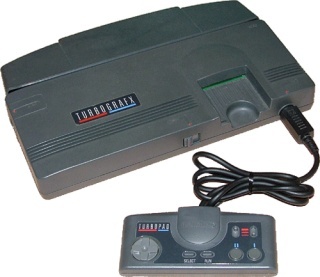 The TurboGrafx-16 is a console created by NEC. In Japan, it was known as PC Engine. While it enjoyed a relative success in it's homeland, it was ignored in the US due to bad marketing and was not properly released in Europe. It later received a CD-ROM expansion, an upgraded model supporting both cards and CDs as well as a handheld version of the console. There was also an upgraded model called the SuperGrafx in Japan where it had 5 exclusive games but could not run CD games. For more details on this program, please visit the Mednafen page. All info about this program can be seen here. Actually a multiplatform emulator, and probably the best choice for emulating the TurboGrafx-16. A command-line program, it supports both Hu-Card and CD games, as well as games which use the Arcade Card expansion. A better choice if you don't like to tinker with command-line programs. It still doesn't support the Arcade Card expansion, however. This page was last edited on 25 July 2018, at 05:12.